This past weekend I was talking to a sweet friend who told me about a new investment she's in. One that will have a great return. She and her husband have decided to be intentional about their marriage this year and truly invest in it. If you invest in anything, your marriage should be it. Why should you invest in your marriage? Marriage is forever. When you said "I do," you were promising God and your husband to be with him forever. Why would you not invest in something that should last a lifetime? You are teaching your kids about marriage. Whether you are trying to or not, you are teaching them. Your daughters are learning how to be a wife and what kind of husband to marry. And your sons are learning how to be a husband and what kind of wife to marry. Teach them wisely. How should you invest in your marriage? Date. I cannot say it enough: date your mate! Dates do not have to be extravagant. Go for a walk around the block. Get ice cream and talk while you eat it. After the kids go to bed, have a candle lit dinner and dance in the dark. Whatever you do, just date! Pray for your marriage. You should daily pray for your marriage, your husband and for you as a wife. What is the great return of investing in your marriage? The more you invest in your marriage, the better it is going to be. Simply put. If you don't water a plant, it dies. If you don't water your marriage, it dies. As Christians, we are the bride of Christ. A good marriage is a glimpse into the love and life with Jesus. 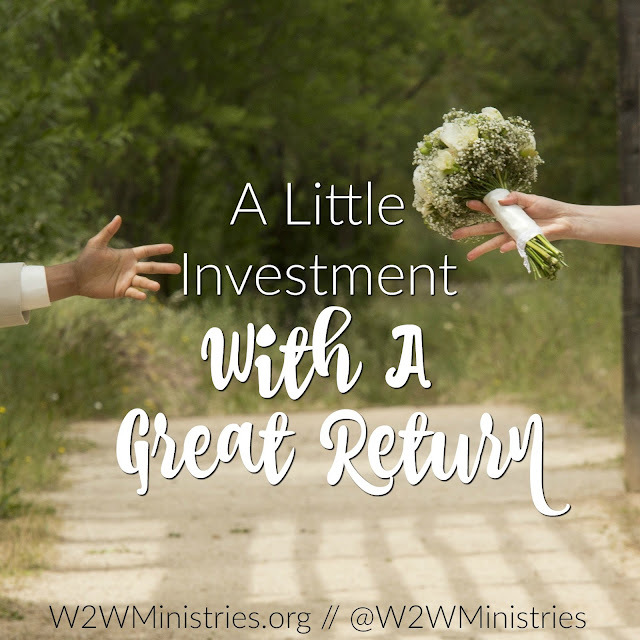 This year, commit to making a wise investment and invest deeply into your marriage. I definitely need to do this for my sake and my kids', thanks. We celebrate 40 years soon, and it still takes work, forgiveness, dating, kindness, nurturing, etc. Never are you done investing in each other.